Lifting loads that have a horizontal velocity (e.g. lifting from a conveyor) is often seen in industry and it was hypothesised that the inertial characteristics of these loads may influence lifting technique and low back stress. Seventeen male participants were asked to perform lifting tasks under conditions of four horizontal load speeds (0 m/s, 0.7 m/s, 1.3 m/s and 2.4 m/s) and two lifting frequencies (10 and 20 lifts/min) while trunk motions and trunk muscle activation levels were monitored. Results revealed that increasing horizontal load speed from 0 m/s to 2.4 m/s resulted in an increase in peak sagittal angle (73° vs. 81°) but lower levels of peak sagittal plane angular acceleration (480°/s2 vs. 4°/s2) and peak transverse plane angular acceleration (200°/s per s vs. 140°/s per s) and a consistent increase in trunk muscle co-activation. Participants used the inertia of the load to reduce the peak dynamics of the lifting motion at a cost of increased trunk flexion and higher muscle activity. 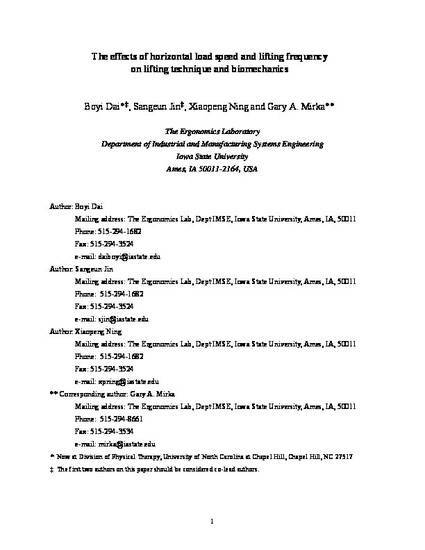 This is a manuscript of an article published as Dai 1, Boyi, Sangeun Jin 1, Xiaopeng Ning, and Gary A. Mirka. "The effects of horizontal load speed and lifting frequency on lifting technique and biomechanics." Ergonomics 53, no. 8 (2010): 1024-1032. doi:10.1080/00140139.2010.493957. Posted with permission.